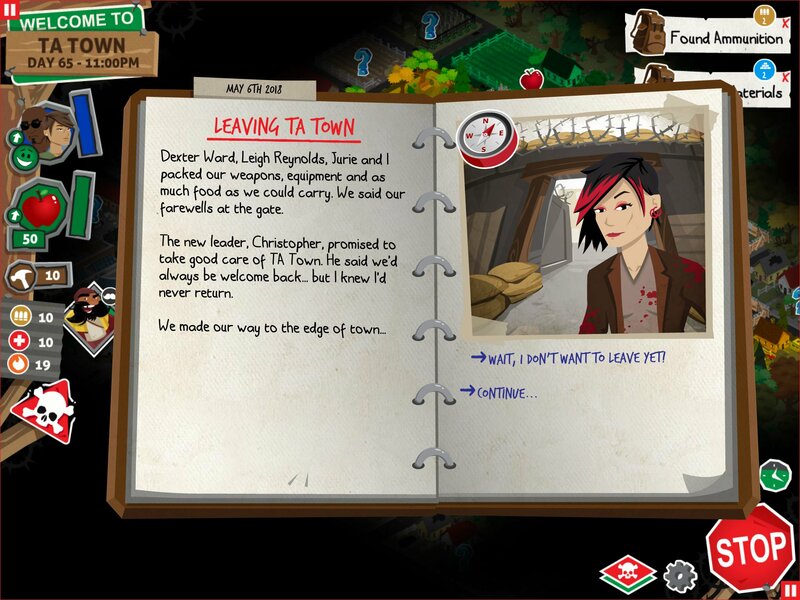 ‘Rebuild 3: Gangs of Deadsville’ Review – Can I Kill One More Zombie Mom, Please? Although the tide has subsided a bit, it’s still pretty hard not to bump into a few zombies when playing video games or watching TV shows. We are definitely past the zombie wave crest, but those lovely creatures are still dragging their destroyed bodies towards us every opportunity they get. The zombie theme’s popularity makes any new game about zombies a “been there-done that" kind of affair. 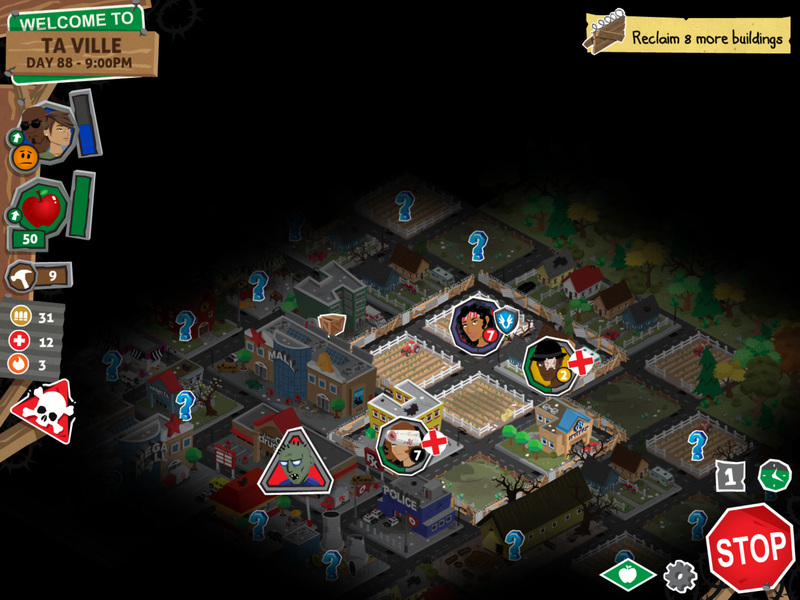 Still, we do occasionally see games that use the zombie theme well, and Sarah Northway’s Rebuild 3: Gangs of Deadsville ($4.99), a strategy sim game about restoring (or remaking) civilization after the zombie apocalypse, is definitely one of the good ones. Rebuild 3, much like The Walking Dead, cleverly uses zombies as the backdrop to the challenges of rebuilding society after it collapses. The game focuses (although not in great depth) on the choices that come with the post-apocalyptic rebirth, be those organizing a harmonious co-existence between disparate people or clashing with other survivors whose vision of society differs greatly from yours. With a great art style and plenty of strategic options to consider, Rebuild 3 is a challenging and relatively-complex 4X game that will give you that “one more turn" kind of gameplay and many bleak-yet-amusing moments. So, how do you go about surviving and thriving in Rebuild 3? The game has an overarching, but relatively thin, narrative that helps give some cohesion to your journey from city to city in the Campaign mode (the game also offers a Quick Play Mode with customizable maps). Told in still images, the story sets the scene for the challenge that’s to come, putting you in the shoes of a man or woman who has just watched the world collapse under the weight of countless zombies. You get to customize your hero’s looks and, more importantly, his or her starting skills by picking from a list of professions, each with its own perks. Then, you set off from crumbling Seattle and begin rebuilding the first of many cities. You get to view your cities in an isometric view and mess with them either in real-time (with the ability to pause at will) or turn-based. Your cities consist of many blocks, each marking a specific type of building such as a pawn shop, a workshop, a hospital, and so on. 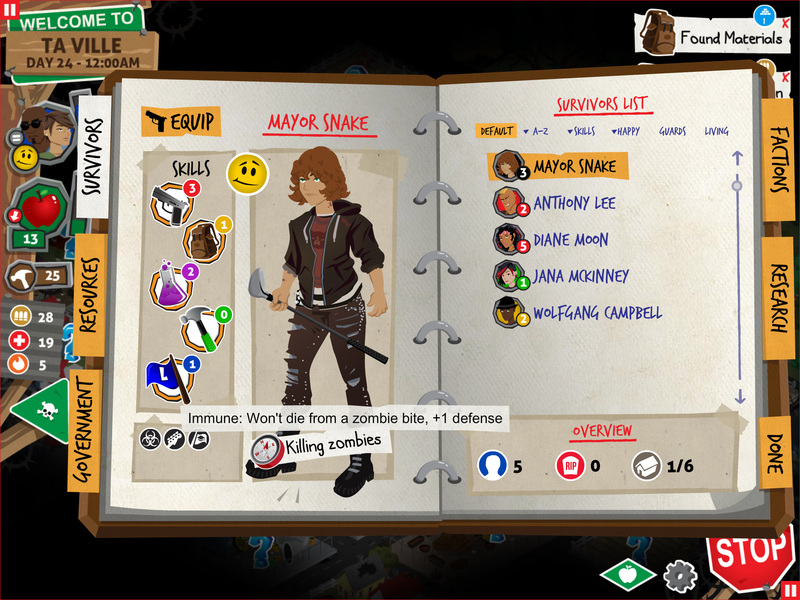 Starting with four survivors, you’ll be reclaiming buildings to expand your city, scavenging to find more weapons and items, improving and upgrading buildings to better sustain your group, leveling up your characters by picking specific skills for each one, and, of course, battling the relentless zombie hordes. Emulating the reality of the situation, the game has a “fog of war" that turns information into a valuable resource. So, you’ll need to do plenty of exploring in order to guard from dangers and gradually expand. One of the features I enjoy in the Rebuild series (I’ve also played the original one for many hours) is how the urban environment of the game makes exploration much more entertaining; in Rebuild 3, the abandoned city around you offers a much more interesting space to explore, making exploration and expansion entertaining rather than a necessary chore. This urban environment forces you to plan your expansion rather than simply trying to expand into a big square. You’ll have to figure out if there’s a hospital nearby you can reclaim, which will help your injured party members recupperate faster, or a school to help your party members improve their skills, and so on. 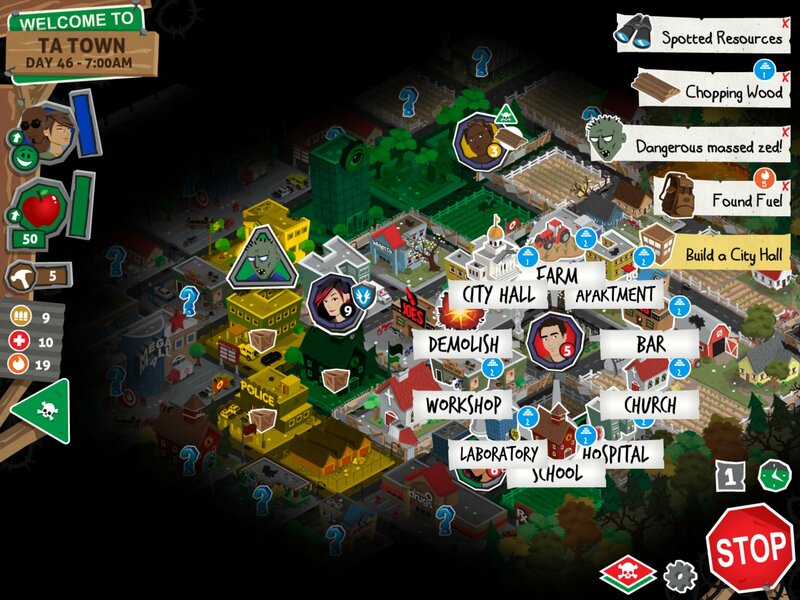 By only allowing you to reclaim spaces adjacent to already-reclaimed spaces, the game cleverly forces you to plan carefully, especially at higher difficulty levels, and increases the danger from zombie hordes’ attacks. Why don’t you simply reclaim every building around you then instead of picking and choosing, you might ask. 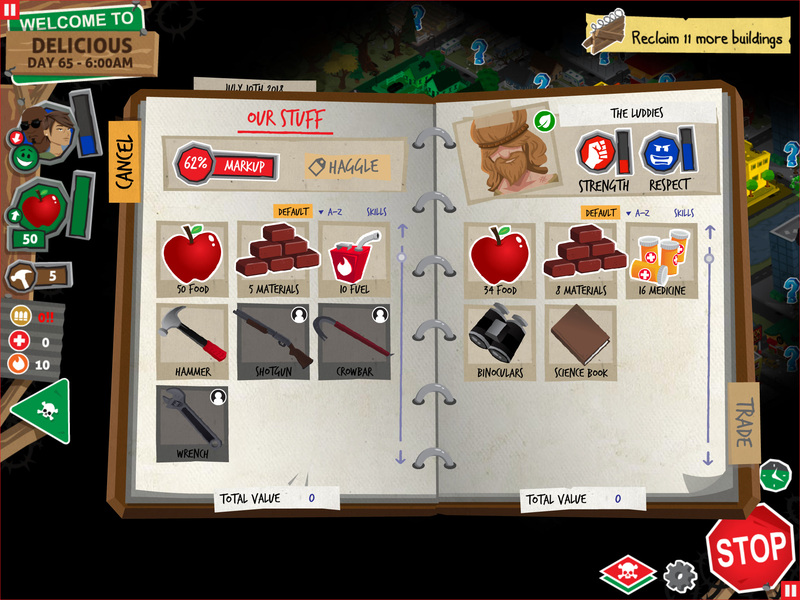 Well, the reclamation mechanic, and pretty much the whole game, is designed around scarcity; as anyone who’s watched a zombie apocalypse movie knows, you can’t find the supplies you need because zombies are the worst staff a shop could have. Reclaiming buildings requires materials that you can only find by scavenging, trading, or chopping wood. So, you can only reclaim a few buildings at a time due to lack of proper material. All other resources, such as food, fuel, medicine, and so on, are also very limited, which results in constantly having to manage your city’s supplies. While this part of the game includes a bit of micromanagement, the main resources you need aren’t that many so I never felt like I had to spend all my time fiddling. Of course, those resources aren’t just scarce, they are also behind walls of zombie bodies, which makes getting to them trickier than simply walking into a hospital, grabbing supplies, and heading home. If you’ve seen any recent zombie movie or show, the scavenging runs hide the most dangers. The game perfectly emulates these dangers by making scavenging trips quite dangerous if you don’t send well-armed survivors. Also, the resources in a building will deplete once you scavenge it, which pushes scavenging runs into increasingly dangerous territory further from your part of the city. Reclaiming buildings also requires that you first kindly evict their previous, slightly-undead occupants before making that building part of your growing, lovely city. This constant rhythm of exploring, scavenging, killing, and reclaiming provides players plenty to do in Rebuild 3. To perform all the reclamation and…renovation, you need a strong group of survivors ready to bring back civilization from its half-chewed state. Rebuild 3‘s survivors have their own skills, their likes and dislikes, and their personalities, all of which factor into how they’ll behave in your city and what kinds of tasks they can successfully perform. Each has a few main skills, like defense, leadership, and so on, but also many perks acquired as the game progresses. The skills can be improved through visiting a school (people can’t get a break from schooling even when the world has collapsed), when a survivor repeatedly performs a specific task, and so on. 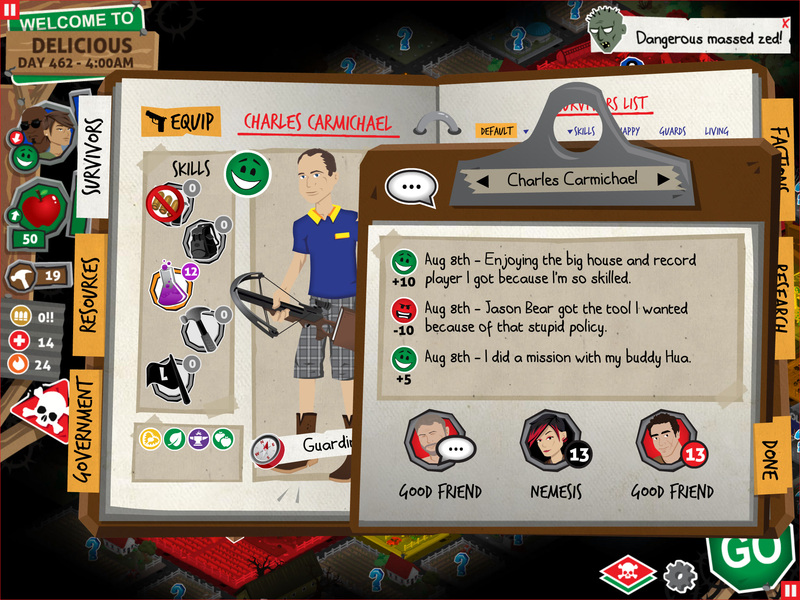 The perks and the leveling system make each survivor feel relatively unique and also help the game’s replayability as different perks and skills can make the game play differently. For instance, if you have a few strong builders, you can quickly reclaim buildings and build a strong city; if you have a few good soldiers, you can dominate the area by killing everything in sight. 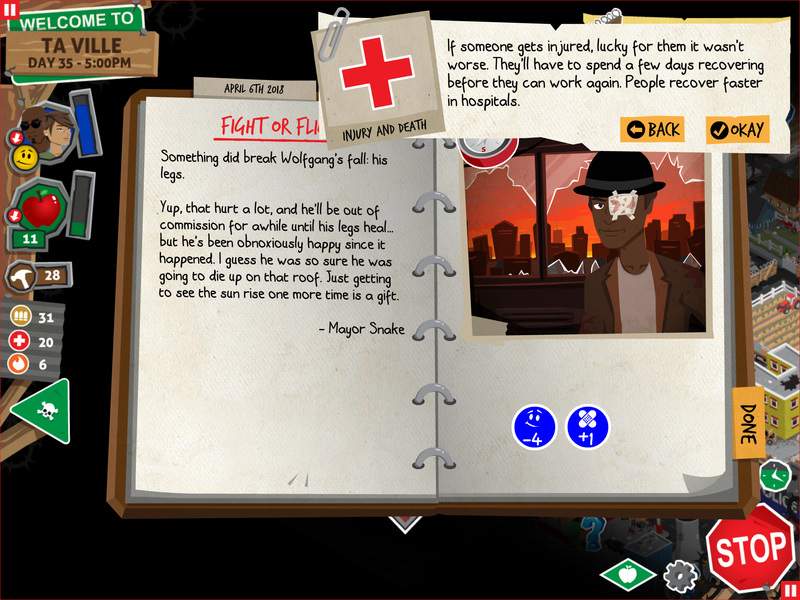 The survivors will also like or dislike other survivors; you might have two strong soldiers, but if they hate each other, they will get all grumpy when they go on missions together, forcing you to plan your mission parties not only according to skills but also to the survivors’ preferences. While I still didn’t care about my citizens much (they aren’t that fleshed out), it was still fun to have to deal with their complaining and preferences. And you’ll need to have strong men and women in your city because you will be constantly under attack either from zombies or from other factions, a new addition to the series. The zombies are a constant, moving threat that will force you to keep some of your people guarding your city. The game will inform you of zombies approaching, which is a good thing since in larger cities you’ll have a hard time keeping track of the zombie threats by yourself. Zombies will building-hop towards your city, and you can situate your guards in such a way as to secure any building that’s in danger. This zombie attack mechanic again makes buildings matter since different building types have different defense bonuses. While in the beginning of each city you can easily defend, as your city grows and the threat of zombies grows with it, you’ll have to constantly move guards around to defend while still keeping enough people available to run the city’s day-to-day operations. At some points of the game defending against zombies felt like playing whack-a-mole; not the most interesting part of the game but a necessary one. I’m glad for the addition of other factions to the game because they really help bring the game’s world alive by infusing it with other humans, who have their own interest in mind and will act accordingly. The different factions will start popping around your part of the city, pressuring (or threatening) you to do their bidding or to hand over resources. You can ally with them, attack them, raid them, and even completely eliminate them. The presence of other factions makes the apocapypse feel more “realistic" because as we all know, hell is other people. Also, the various factions add another layer of strategy on top of your usual scavenging and expanding because your “friendly neighbors" can really mess with your city in ways zombies cannot. Unlike the mindless hordes, which simply pester you at the city’s edges, soldiers and raiders from other factions will sneak into your city and cause all kinds of havoc if you aren’t on good terms with their leaders. In order to communicate efficiently with the other factions, you’ll have to create a new government system that will provide guidance to your survivors and make you a more attractive faction to negotiate with. 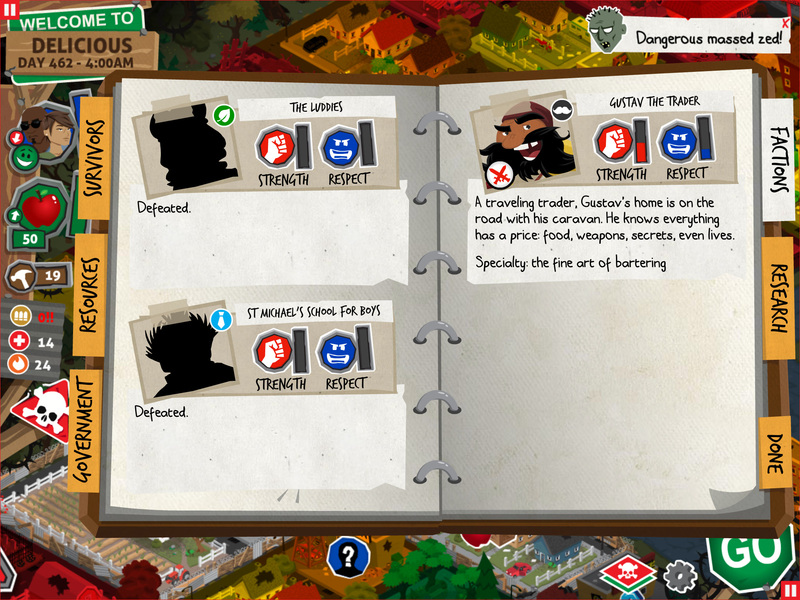 The government mechanic allows you to set various policies for your city, and each of these policies affects gameplay by making people in your city happier or unhappier and influencing aspects like weapon and resource distribution. You might decide that any wealth you find goes to your most skilled survivors, which will keep them very happy but will have the adverse effect on those poor unskilled ones. 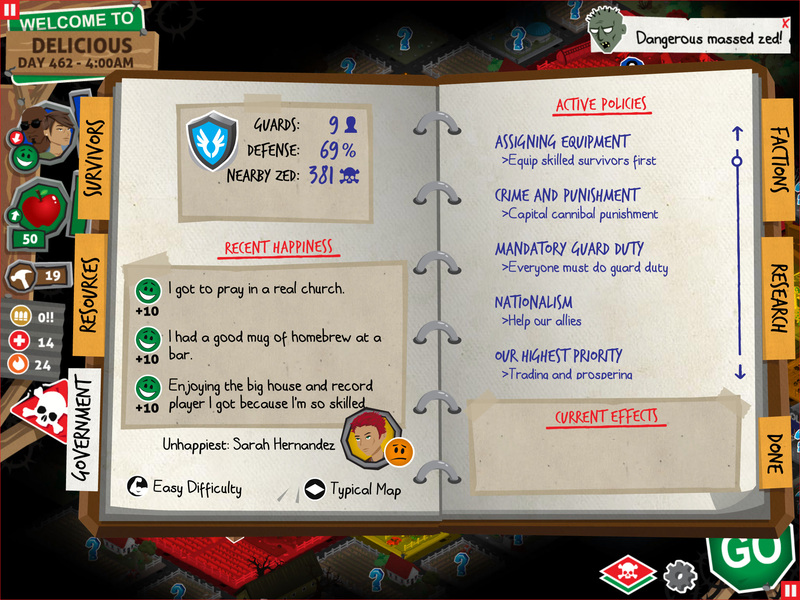 When you consider the various policies you can institute and the various research branches you can pick, which can again have all kinds of effects not only on protection from zombies but also in the way various random events can play out, you can see how much depth and replayability Rebuild 3 has. And if you get tired of playing the game for maximum efficiency, you can decide to play the game as a dictator or as a villain just for variety. Speaking of the random events, Rebuild 3 will keep throwing all kinds of situations at you that you’ll have to resolve, and the results will often be…unsavory. These events, ranging from localized events, like a wailing Banshee that is keeping everyone awake, or an illness that seems to be spreading, ensure that no two playthroughs are exactly the same. I do wish their outcomes were also more random, though, because the more you play the game, the more you’ll know how to react in most events. Still, their great number means you’ll have to play the game quite a bit before reaching the level where you know all of the events and aren’t surprised anymore. Rebuild 3 offers so many options, so many features, and so many things to fiddle with that one could easily get irritated with all the micromanagement if not for a pretty good UI. While it takes a bit of digging around to completely get the hang of, once you figure it out, it works great. All icons have tooltips too, which helps learn the game faster. To run your city, you drag your survivors around to the building of your choice and immediately get content-sensitive options to choose from. All the necessary information is displayed on each avaiable icon (like how many materials it will take to construct a new building), and the time required for each action is cleverly displayed in a ring around each survivor. The only negative aspect of this ring feature is that the current action icon gets in the way of seeing the whole ring clearly, which meant I sometimes couldn’t tell how much longer a specific action would take. Also, one issue I had was that every time a citizen finishes an assigned action, he or she will pop back to the city block he or she originated from. While in some instances this makes sense (like when you are scavenging outside the city limits), when I wanted to clear out a building so I can reclaim it, I wouldn’t know which building I had just “cleansed" because my citizen wasn’t there anymore. I think the ability to choose whether I want this rubber-band action to happen would have been very welcome, especially when the number of survivors increases. Rebuild 3 is a really fun game overall with the kind of gameplay that keeps you coming back for more. I often stayed up later than I planned because I wanted to see if my city was going to survive the zombie onslaught or whether it would collapse, torn at the seams. Visually pleasant, with a lovely cartoon style that makes what would otherwise be a grim game pleasant to play, Rebuild 3 definitely entertains. While the music could be better – it can get both monotonous and occasionally grating – the overall art and feel of the game are definitely an improvement over the previous Rebuild game. 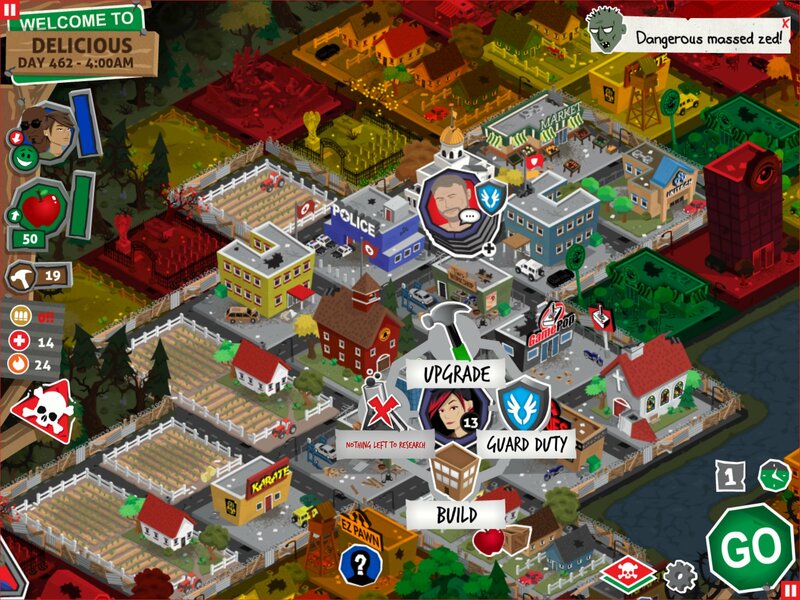 The game is premium with no IAPs at all, and it’s universal. While it does play great on both iPad and iPhone, unfortunately there’s no iCloud save support, a real bummer if I’m honest. If you are looking for a fine strategy sim game with enough depth to challenge but not too much to irritate, look no further than Rebuild 3.